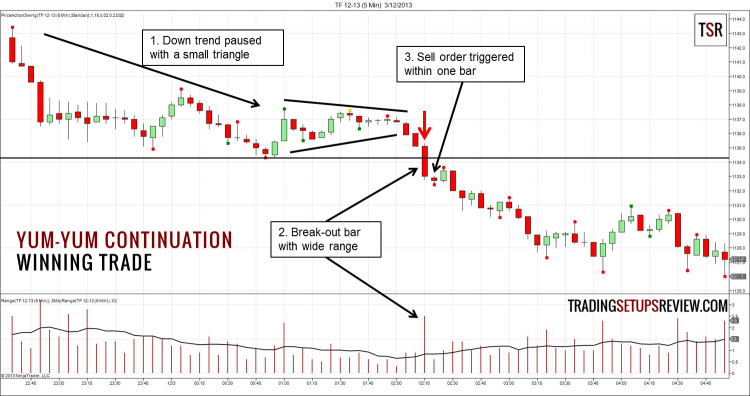 Yum-Yum continuation pattern is a delicious trading setup found in the Ultimate Trading Guide by John R. Hill, George Pruitt, and Lundy Hill. If I’m a book analyst, I would issue a “strong buy” for this book for its variety of sound price-based trading ideas. The day started with a bear trend, before stopping to rest in a triangle formation. A wide-range bar broke the low of the day after breaking out of the triangle. The lower panel highlights that the wide range of the bar, which is more than two times that of the 10-bar average. The next bar triggered our sell order. 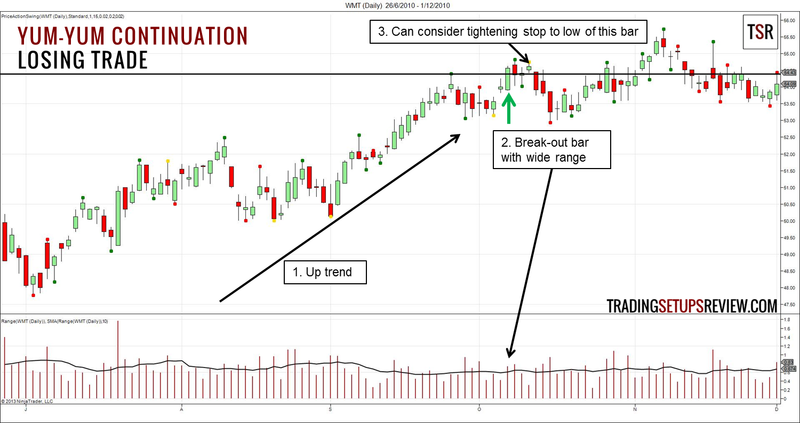 This shows urgency in the selling and confirms the legitimacy of the break-out. 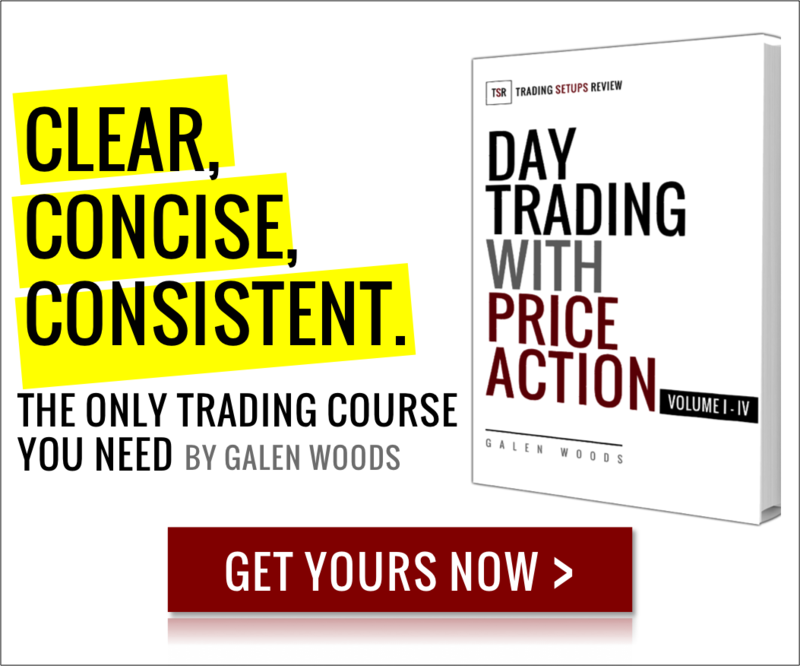 There was an existing up trend, which was essential for a continuation trading setup. The range of the break-out bar exceeded the 10-bar average range. However, compared with the dozens of bars before it, its range was not especially high. Contrast this with the winning trade, where the expansion in bar range was much more remarkable. The next day triggered our buy order but there was not much follow-through. Prices moved sideways for two days before stopping us out with a rapid bear swing. An option for managing the position was to trail the stop to just below any bar that closed higher. The second method is to wait for a break-out of the last extreme of the trend. Because this approach waits for confirmation from the break-out, trend continuation is more likely. However, the entry point is worse and produces a lower reward-to-risk ratio. This is an example of the inevitable trade-off between trading methods. I know some traders who are simply uncomfortable to buy high and sell low, which this strategy requires. Although this is a necessary trait of trend followers, you should only use trading strategies that you are comfortable with. In conclusion, I find the Yum-Yum pattern tasty.